An archaeologist, architect and historian, Abbot Jean-Marie Abgrall (1846-1926), ordained priest in 1870 and dean of the chapter of Quimper Cathedral in 1917, after having been honorary canon (1893), then patron (1905), was a regular member of the Archaelogical Society of Finistère, of which he was president from 1912 to 1923. He is also credited, together with canons Alexandre-Marie Thomas and Paul Peyron, with the annotated new edition of Vies des saints de la Bretagne Armorique [Lives of the saints of Armorican Brittany] (Quimper, J. Salaun, 1901), originally appearing under the title of Vie des saincts de la Bretaigne Armoricque, which was the work of the Morlaix-born Dominican Albert Le Grand (Nantes, P. Doriou, 1637). Canon Abgrall noted the restoration of the façade alone when, in fact, the entire building was restored. 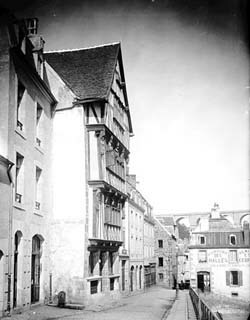 His description of the House known as ‘Duchess Anne’s House’ can be found on pages 268-270 of his presentation of old Morlaix, published in the Bulletin de la Société archéologique du Finistère (tome XXVIII, 1901, p. 264-280). It would nevertheless be rash to conclude, as has been stated on occasion, that the former town house owes its recognition only to its uniqueness in the neighbourhood, which is a historically recent situation that has nothing to do with the spirit in which it was built. The intrinsic qualities of the building, both of its façade and its interior courtyard, bear witness to an architectural and artistic plan entirely for the glory of its first owner, and gave it a certain status at the start of its designation, before ensuring its preservation: the slight protrusion over the Rue du Mur that is plain to everybody, and which is the first thing Canon Abgrall noted about the former town house, accounts for the aims of the earlier municipal demolition plans. Its last-minute listing enabled the safeguarding of a particularly remarkable part of our heritage. Entire article on “Le vieux Morlaix” (Old Morlaix) by Jean-Marie Abgrall (in French).